The area became a major corridor for illegal crossings in the mid-2000s, prompting the Bush administration to weld steel plates to a barrier made of steel bollards that had been designed to stop people in vehicles, not on foot, Border Patrol spokesman Jose Garibay said. In those spots, there is no concrete footing to prevent digging. On. Jan. 9, the Border Patrol arrested a group of 247 people, mostly from Central America, who turned themselves in to agents in a highly remote part of New Mexico. The agency said many needed medical care. Last edited by KathyInAR; January 19th, 2019 at 05:40 PM. barrier made of steel bollards that had been designed to stop people in vehicles, not on foot, Border Patrol spokesman Jose Garibay said. In those spots, there is no concrete footing to prevent digging. For over a century, the residents in these mountainous towns have frequently chosen the first option, boosting Guatemala’s position in the global coffee markets. But in recent years, a crisis in the sector has deepened—thanks to low global coffee prices, booming production in countries such as Honduras and Vietnam, and recurring coffee plagues. As the industry struggles to stabilize, rural Guatemalans in the highlands can no longer rely on coffee as a secure income source. Increasingly, they are choosing to leave for the United States. Economic Migrants are NOT refugees and have no claim to asylum! Here is the real reason that Democrats have shifted their position of optics when talking about what they believe are Hispanic VOTERS concerns. “We project that the 2020 election will mark the first time that Hispanics will be the largest racial or ethnic minority group in the electorate, accounting for just over 13 percent of eligible voters – slightly more than blacks. This change reflects the gradual but continuous growth in the Hispanic share of eligible voters, up from 9 percent in the 2008 presidential election and 7 percent in the 2000 election,” said Pew. 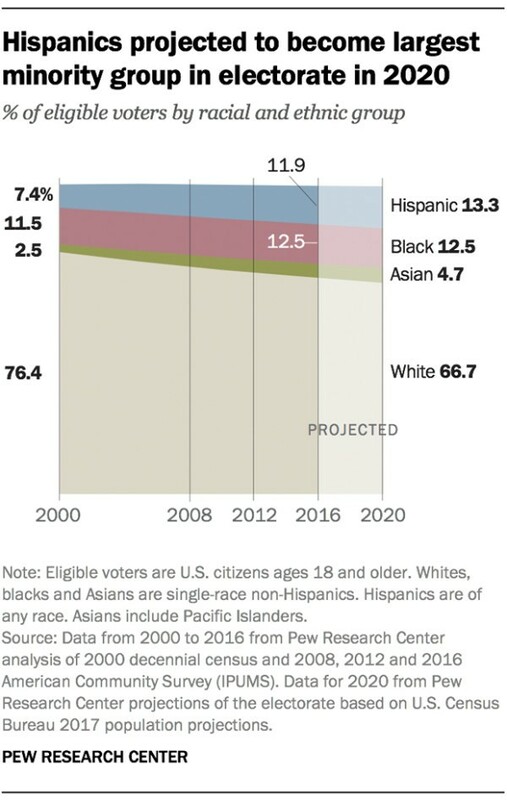 In 2020, there are expected to be 32 million Hispanic voters and 30 million blacks. A graphic accompanying the Pew analysis of Census data indicated that 10 percent of the non-white vote will be immigrants. “Taken together, this strong growth among minority populations means that a third of eligible voters will be non-white in 2020, up from about a quarter in 2000. This increase is at least partially linked to immigration and naturalization patterns: One-in-ten eligible voters in the 2020 election will have been born outside the U.S., the highest share since at least 1970,” said Pew.